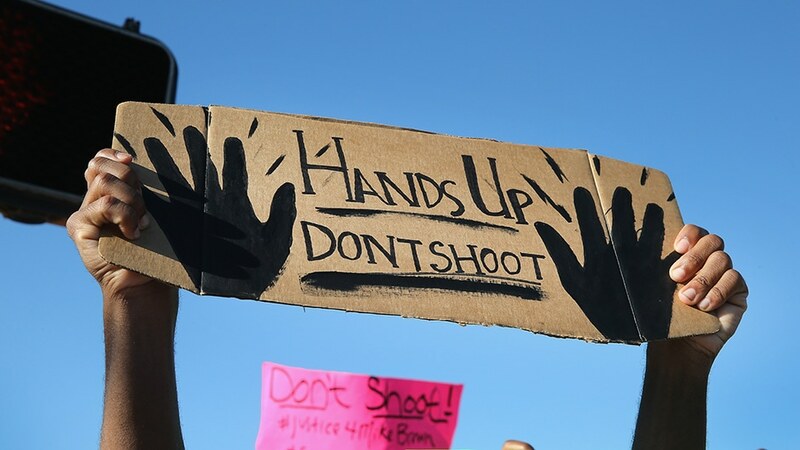 A protest sign during a protest in Ferguson, Missouri, over the shooting of a African-American teenager. Connections: The Hawthorne Effect – does surveillance modify behavior? About Connections: Love it or hate it, history is a map. Those who hate history think it irrelevant; many who love history think it escapism. In truth, history is the clearest road map to how we got here: America in the twenty-first century. In early December, a man was arrested in Pittsfield. He was riding a bicycle when he saw a policeman issuing a ticket to a driver. He stopped, took out his phone and videotaped it. The man was asked to cease and desist. When he refused, the man was arrested, his camera confiscated, and the video erased. In this column the issues are not probable cause, retention of evidence, or the man’s civil rights. Here the focus is on connections with events in our past. Often our assumptions about human behavior today have their genesis in our past. The standoff in Pittsfield has its roots in a factory in Chicago in 1924. Here’s what happened. At the Hawthorne Factory, the owners wanted to know if the lights on the factory floor should be brighter or dimmer. The owners hired researchers to determine the exact level of light that would cause (correlate positively) increased productivity. In the end the vital lesson learned had little to do with the intensity of the lights. The lesson was that everyone worked harder and productivity increased when they were being watched. The result was unintended and unexpected. In fact, it was undetected for two decades. Simply put the Hawthorne Effect states that human behavior is changed by the act of observing it. From Landsberg in 1950 onward, the research was replicated and validated. The theory called the Hawthorne Effect was accepted in the scientific community, and became part of “common knowledge” accepted by the general public. Subsequent studies unearthed some unique findings. For example, one study set out to determine people’s propensity to litter in a cafeteria before and after posters were hung on the cafeteria wall. The posters had eyes on them. The study found a statistically significant correlation between less littering and the presence of the signs on the walls. People littered more and bussed their trays less often when the signs were removed; they littered less and bussed more often when the signs were in place even though no human being was actually watching them. So behavior changes when under observation, but how? Thomas Jefferson said, “Whenever you do a thing act as if all the world were watching.” His assumption was that we behave better when being watched. Back to Pittsfield: when asked, the man said he taped the policeman, “because of Ferguson.” Did the man believe that if he taped (watched), the policeman the officer would behave better? Perhaps, because Thomas Jefferson, the researchers in Hawthorne, and subsequent researchers apparently believed behavior always improves under observation. We have seen news stories – “film at 11” – of people being beaten and even choked to death. The camera didn’t prevent the tragedy. Perhaps we can say only that behavior changes under scrutiny and not how when the “observer” is a camera. Or, perhaps those violent acts were anomalies, and in the majority of cases, observed behavior changes for the better. What will historians report when they look back on this period? Were we microscopically observed and therefore better behaved? If people and posters had a similar effect, wouldn’t a camera? Is filming/taping the same as watching? We should do another study and find out. It would be nice to know that because we are being constantly observed, we are more productive, have stopped killing one another, and even decreased littering. Like people and eyes on posters, do cameras cause us to behave better? And, in this much-recorded, selfie-taking, Internet-posting, reality-TV-airing world — please define better. As I read this article I realized that the Hawthorne effect can lead to at least two interpretations. Is behavior improving because the subjects feel valued and celebrated by the attention or because the subjects feel afraid of possible negative consequences? From these thoughts, I realized that the first option is more likely in a partnership paradigm and the second in a dominator paradigm. Further I realized that the operative paradigm may be more determinative of behavior than any temporary interventions. For example, in a partnership paradigm, participants tend to feel included, valued and cooperative, all of which will tend to promote and generalize positive behaviors. In a dominator paradigm participants tend to feel coerced, fearful and adverse. These feelings tend to diminish positive behavior changes and interventions intended to increase those behaviors will need to be kept in place long term and renewed and refreshed periodically, with a consequent increase in overhead costs, negative feelings and frustration among those in leadership positions.